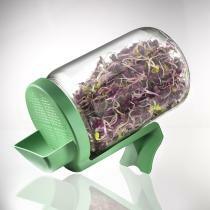 Glass sprouting jars provide one of the simplest, easiest methods for sprouting seeds, legumes, grains and beans! Thanks to Eschenfelder sprouting jars, the seeds are soaked in water overnight. Then all you have to do is rinse them twice the day after under a running tap.